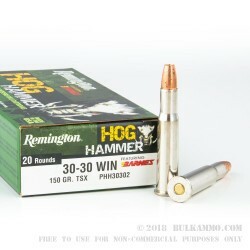 This 30-30 Win cartridge from Remington’s Hog Hammer line of ammunition is, as you might suspect, perfect for dispatching with meddlesome swine. 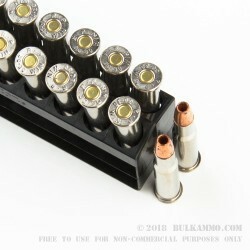 It features a 150 grain Barnes TSX hollow point projectile, the all copper composition of which permits up to 28 percent deeper penetration through a hog’s tough hide than a comparable lead core bullet could offer. 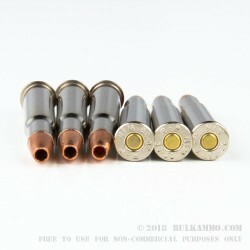 Copper’s toughness means that this bullet retains 100 percent of its weight upon completion of expansion, letting it deliver a deep wound channel, and this bullet’s four “cutting petals” expand to double its original diameter to wreak absolute havoc through bacon, ham, and chop alike. This bullet’s sleek profile gives it an extremely flat trajectory, and its proprietary Accu-Groove design translates into less of the fouling that could otherwise cause a miscreant oinker to get away with its crimes. 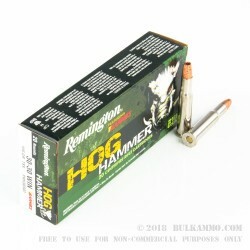 This cartridge is perfect for nighttime hog hunting, as its flash suppressed propellant won’t blind you in the dark.